FIFA fever is to hit soon and can you identify this famous sportsperson ? The 2014 FIFA World Cup will be the 20th FIFA World Cup, scheduled to take place in Brazil from 12 June to 13 July 2014. Brazil is hosting the competition for the second time, the first being in 1950. The national teams of 31 countries advanced through qualification competitions that began in June 2011 to participate with the host nation Brazil in the final tournament. A total of 64 matches are to be played in twelve cities across Brazil in either new or redeveloped stadiums, with the tournament beginning with a group stage. This perhaps will be most watched sports event. It will be too rudimentary to say that the game is played with a ball ~ football is a ball inflated with air where goals are scored only when the ball enters one of two designated goal-scoring areas; football games involve the two teams each trying to move the ball in opposite directions along the field of play. The first balls were made of natural materials, such as an inflated pig bladder, later put inside a leather cover, which has given rise to the United States slang-term "pigskin". Modern balls are designed by teams of engineers to exacting specifications, with rubber or plastic bladders, and often with plastic covers ~ to correct – it is not a game played with (any) ball…….. but ‘brazuca’ this time… brazuca, what ?... The Adidas “Brazuca” is the official match ball of the 2014 FIFA World Cup. It will be made by the company Adidas, a FIFA Partner and FIFA World Cup Official Match Ball supplier since 1970. It is a name selected by public vote in Sept 2012, organised by the Local Organising Committee and Adidas, with over one million Brazilian football fans voting the name Brazuca - with 77.8% of the vote. According to FIFA, "the informal term “brazuca” is used by Brazilians to describe national pride in the Brazilian way of life", and "mirroring their approach to football, it symbolises emotion, pride and goodwill to all". The ball is a developmental successor to the Adidas Tango 12 series of balls, with the same bladder and carcass but a different surface structure. According to Adidas : The Brazuca ball has six polyurethane panels that are bonded to keep the ball the same weight and roundness in even the thickest of rain. The never-before-seen panel shape revolutionizes the game by producing faster flight speed and maintaining true roundness. 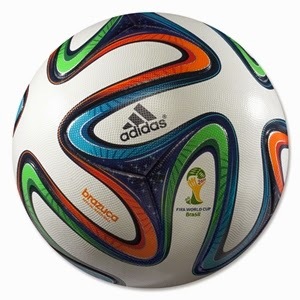 The bladder of the Brazuca ball is made of latex and provides the desired rebound. The ball is textured and feels more like the Adidas’ Finale 13, the official UEFA Champions League ball, than the Adidas Jabulani used in South Africa four years ago. The Brazuca ball has been stated to be more aerodynamic than the Jabulani ball. Adidas unveiled the Brazuca at a launch event on 3 December 2013, two days ahead of the traditional unveiling of the World Cup match ball at the draw of the group stages of the World Cup Final. The launch event took place in Rio de Janeiro at Parque Lage and featured a 3D light projection, which revealed the Brazuca to everyone in attendance. Some additional info reveals that technology will get a new meaning as the Brazuca balls to be used in the mega event will come with six in-built HD cameras capturing 360 degree view of the on-field action. Encapsulating everything that's Brazil and its passion for the game, the ball has shades of blue, orange and green, and stars on it reflecting the vibrancy and flair associated with the game. Between the seams the Brazuca also has a different geometry to different balls, which aerodynamics experts believe, will help it remain more stable in the air. When it comes to the usage of social media, Brazil is the second-largest country worldwide, with more than 85% of the population being active on Facebook, Twitter or other social networks. So consequently, the naming process was created as a huge social media activation giving Brazilian football fans the chance to pick their favourite name. Brazuca was voted for by over 1 million people, coming out on top with 70% of the total votes ahead of ‘Bossa Nova’ and ‘Carnavalesca’. Usually, balls consist of 12, 16 or even 32 panels. And like with a jigsaw puzzle, the more pieces you have, the more mistakes you can make putting it together. On a ball, having more panels also means having more seams and a seam, especially the areas where two or more seams converge, is always a source of imperfection – more water intake, less consistency, less durability, etc. Creating a ball with only six absolutely identical panels actually is almost geometrical magic, it is claimed to be. Adidas has the long history of developing the official ball for every FIFA….the official ball in 2010 was Jabulani ~ and in the earlier version in 2006 FIFA in Germany it was the Teamgeist meaning "team spirit", could not be trademarked. Incidentally, the man at the start is famous but no soccer player … it is - Novak Djokovic, a great tennis star from Serbia, currently ranked world No. 2. Djokovic has won six Grand Slam singles titles and has held the No. 1 spot in the ATP rankings for a total of 101 weeks.